Taking a walk in the woods can lower your stress and boost your immunity according to scientific research out of Japan. With cold and flu season fast approaching, it’s always a good idea to boost your immune system naturally. In addition to healthy food, herbal supplements, sufficient sleep, and some lifestyle practices, such as meditation and yoga, what else can you possibly do? How about taking a walk in a forest? In this Loyola University article, Dr. Aaron Michelfelder, a professor of Family Medicine at Loyola University Chicago Stritch School of Medicine, explains that taking a walk in nature, particularly the woods, is especially helpful for our health, because it not only decreases your stress, blood pressure, and pulse rate, but actually increases white blood cells, which are essential to fighting off viral infections. Now you may be asking yourself if any old walk, whether through an urban downtown area or a suburban neighborhood will do. The answer is not necessarily. A 2010 Japanese study published in the Journal of Environmental Health and Environmental Medicine showed that those who spent time in a forest environment fared better physiologically (e.g., they had lower cortisol levels, higher parasympathetic nerve activity, lower sympathetic nerve activity, etc.) than those who spent time in city environments. Also, walking in nature has a benefit you can’t get from a concrete jungle. Plants secrete chemicals called phytoncides that not only protect them from disease and rotting, but also benefit us by increasing our natural killer cells, which help ward off microbial infections and stop the formation of tumors, according to this 2007 study. 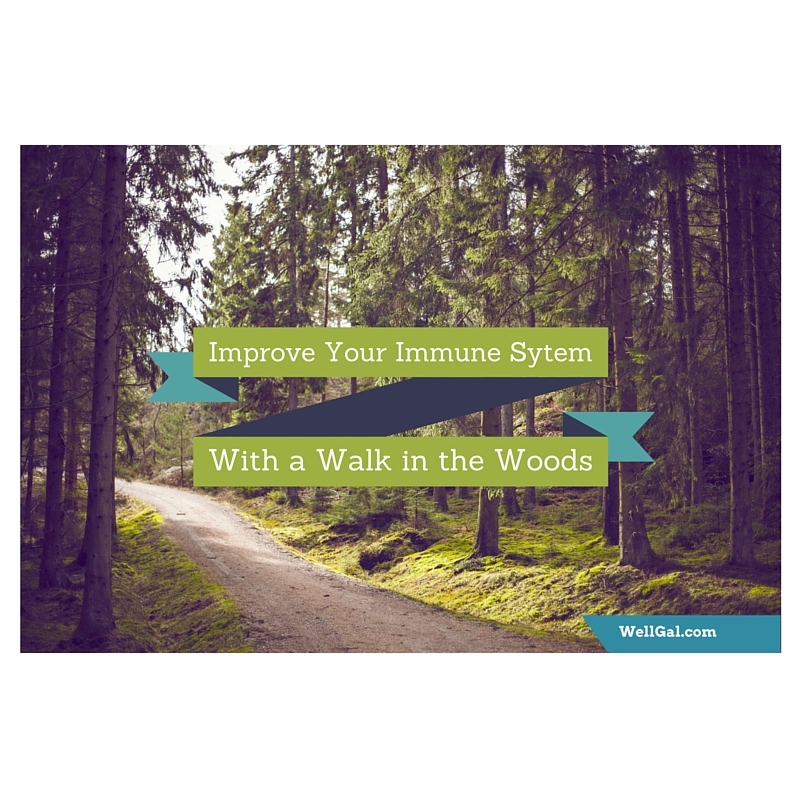 This increased natural killer cell activity lasts up to 30 days, which means that spending just a day or two in the forest could boost your immune system for a whole month. In other words, taking a walk in the woods, or “forest bathing” as the Japanese researchers have coined it, is preventative medicine and could very well help keep not only viruses at bay, but even cancer! By the way, the concept of spending time in nature to improve health and renew yourself is in line with Ayurveda, a 5,000 year-old system of natural healing from which Chinese and early Greek medicine originated. Also, the idea that breathing in volatile organic compounds from forest plants helps us physiologically is not so much of a surprise when you consider aromatherapy, which uses essential oils to bring balance on an emotional, physical, spiritual, and mental level. Plus, the notion that nature is healing is intuitive. Don’t you always feel better when you get away from the craziness of modern society (think cell phones, car horns, artificial lighting, etc.) and immerse yourself in nature? Somehow, you feel better and the stress just seems to melt away, right? We as humans simply need to connect with the world around us and make a conscious effort to do so. So, how about it? Why not take a walk? Bring a friend or the whole family, too! If you can’t make it to a wooded forest, take a stroll through your local park. Or, if you’ve got a weekend to spare, maybe go hiking or camping in a state or national park. You’ll not only feel better mentally, but amp up your immune system to fight off any nasty viruses that may come your way this fall and winter. Copyright © Karen Peltier and Well Gal, 2013 – 2015. All rights reserved.